"Action-packed, amazing new tale in the long-running Carpathian series!" Lorraine Peters had been trying to lose herself in the woods following the loss of her whole family and with the subsequent scandal her so- called friends. The last thing she expects is to find and rescue a man near death. But, Andor Katona is not your average man, he is an ancient Carpathian. He is one who had lived in a monastery, without hope of ever finding a lifemate, until he and the others are told their mates are out there and they must go find them. He and other "brothers" arrived in the United States and became the army to fight the Malinov brothers who turned vampire and now work to destroy any hunters who might try to stop them from ruling the world. Andor had given up hope and gravely injured after fighting a group of vampires and then attacked by human vampire hunters who had mistaken him for their prey, thinks perhaps meeting the sun might not be a bad thing. Until out of nowhere comes a damsel, not in distress but carrying the weapon of a saucepan and puts an end to the immediate danger to him. Still seriously hurt, he must help his lifemate protect him until the healer and other warriors arrive. Lorraine has a lot to learn and learn quickly, or before their life together can begin, it will end with Andor's death. 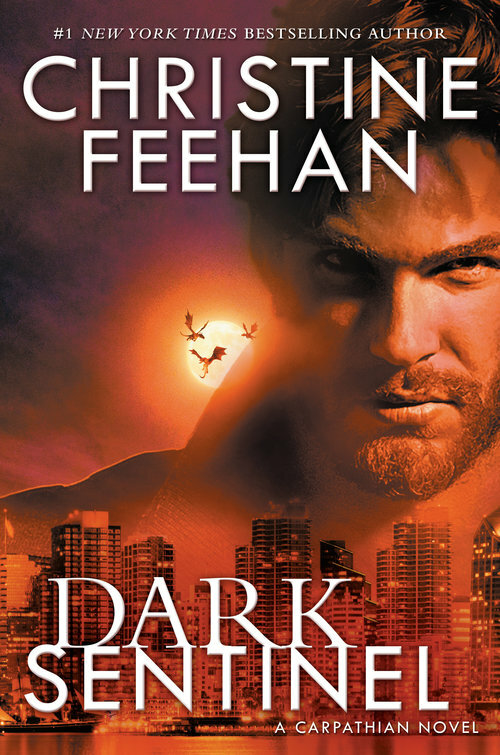 DARK SENTINEL is, in my opinion, one of author Christine Feehan's very best offerings in her Carpathian series. It follows closely to DARK LEGACY with the ancient Carpathians coming to work with Tariq, the prince's choice of leader in this new war. We learn more about these men who are learning to deal with a modern world. What I found heartwarming or maybe a little heartbreaking is that though they might no longer feel emotions, they do find a sister in Lorraine and will protect her as they would their own blood. I loved how they all became a little family as they bonded together to save Andor. She is a fighter, taught from childhood in the martial arts, bringing bravery, cunning and smarts to the little group as well as the simple ability to care for the others as she had her own brother. Andor is very patient with her, giving her time to work out all the things in this new reality she finds herself in. I love Ms. Feehan's Carpathian books and although I miss the prince and the characters from the earlier books, I find that I can't wait to see what happens to this group of men and women as they continue the fight against evil. DARK SENTINEL is action packed with the group of Ancients (and Lorraine) fighting vampires, puppets and protecting humans where they can. Add in the sweet and hot romance between Lorraine and Andor and you will not want this book to end.